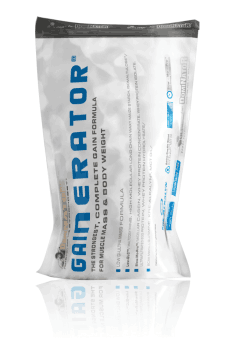 Olimp Gainerator is an advanced gainer supplement that is a source of carbohydrates in the patented Low-GLC ™ formula and the Slow-Mo-Pro ™ protein complex. It is enriched with MCT oil, buffered creatine monohydrate Kre-Alkalyn®, BCAA amino acids and L-glutamine. The supplement effectively complements the energy needs of the body, and the synergistic components will effectively affect the construction of a qualitative muscle mass. Low-GLC™ - is a patented carbohydrate formula derived from poly- and oligosaccharides, long-chain waxy maize starch - waxy maize and isomaltulose. This composition provides components with low and medium glycemic index and adequately balanced absorption kinetics, ensuring long-term energy supply to the working muscles. It helps to maintain a consistent blood sugar levels and prevents an energy comedown after using the available glucose. Poly and oligosaccharides provide the energy immediately, available about 30 minutes after consumption, while waxy maize has an absorption time of up to 4 hours. In addition, after the training, the blend effectively replenishes the muscle glycogen stores, shortening the time needed for regeneration and helping to maintain the anabolic environment. Slow-Mo-Pro™ is a blend of various protein sources characterized by high bioavailability, but with different absorption kinetics. The composition includes micellar casein, concentrate, isolate and hydrolyzate of whey proteins and egg albumin. They all provide a complete profile of amino acids necessary for the proper course of the muscle fiber regeneration and anabolic processes. Protein, as the basic building block of the skeletal muscle, is an essential nutrient to rebuild the damage caused by training. It also intensifies the rate of muscle protein synthesis (MPS), regulating anabolism. Providing protein with different absorption kinetics, ranging from 30 minutes for hydroisolates and even up to 8 hours for micellar casein, ensures a constant supply of protein to the muscles, supporting their regeneration. In addition, during longer breaks between the meals, the supplement provides the protection of muscles against catabolism. Kre-Alkalyn® - buffered creatine monohydrate, which increases the exercise capacity of the body and promotes the construction of the qualitative muscle mass. The used form of creatine has greater chemical stability and is resistant to the acidic stomach environment, which deactivates creatine. Thanks to this, the buffered form of creatine monohydrate effectively increases its content in the skeletal muscles, raising the body's exercise capacity. Creatine intake is also associated with the growth of the activity of hormones that increase the rate of MPS, such as insulin-like growth factor (IGF-1) or growth hormone. Creatine also reduces the activity of myostatin - an IGF-1 antagonist that limits the development of muscles. BCAAs- the branched-chain amino acids - L-leucine, L-isoleucine and L-valine, favourably affect the rate of the muscle protein synthesis and the management of the skeletal muscle glucose. Leucine, the strongest of all amino acids, stimulates mTOR kinase, which results in an increased MPS rate and a promotion of muscle anabolism. The remaining amino acids support this process a little less, however, they contribute to the increase of glucose uptake by skeletal muscles and acceleration of muscle glycogen resynthesis. L-glutamine - the most abundant amino acid in skeletal muscle, responsible for the transport and storage of nitrogen in the body. It supports the process of muscle regeneration and protects the muscle tissue against the activity of proteolytic enzymes that break down the amino acids contained in skeletal muscles. This amino acid also supports the synthesis of new muscle proteins, supplying nitrogen to the tissues requiring it. After completing the training, L-glutamine along with carbohydrates, can accelerate the replenishment of glycogen stores in skeletal muscles. MCT oil - contains Medium Chain Triglycerides, which do not require digestion and breaking down into shorter acids, so they can provide an immediate source of energy. MCT can support the exercise capacity of the body, and also have a positive effect on the process of reducing the body fat. Thanks to this, it is possible to gain as much lean muscle mass as possible without gaining an excessive fat. In summary, Olimp Gainerator is an advanced dietary supplement focused on the development of qualitative muscle mass. The innovative Slow-Mo-Pro™ formula provides proteins with different absorption kinetics and high bioavailability, while Low-GLC™ is a combination of highly bioavailable carbohydrates that will quickly increase the energy levels and help maintain it throughout the training. The addition of a high-quality creatine, BCAA amino acids, L-glutamine or medium-chain fatty acids results in a comprehensive support the process of building the muscle mass. Aromas, thickeners - xanthan gum, sodium carboxymethyl cellulose, gum arabic; acidity regulators - malic acid, citric acid, anti-caking agent - silicon dioxide; sweeteners - sucralose, acesulfame K; colors: carotenes (A), cochineal (B), riboflavin (C), E 150c (D), E 150d (E), E 133 (F), patent blue V (G), indigo carmine (H), chlorophylls and chlorophyllins (I), curcumin (J), anthocyanins (K), pepper extract (L), betanin (M), vegetable carbon (N). (A) - (Z) - Depending on the taste of the product, the symbol (A-Z) of the ingredient used is next to the date of minimum durability (preferably before). ** Isomaltulose is a source of glucose and fructose.